D.C. readers — Axios’ triple header continues tomorrow morning with Kim Hart hosting a conversation on how 5G will impact industries and the world. RSVP here. Among Apple's biggest announcements on Monday was its entry in the battle against app addiction. Apple is expanding iOS's Do Not Disturb feature, allowing users to silence notifications based on a time limit or until they leave a location. 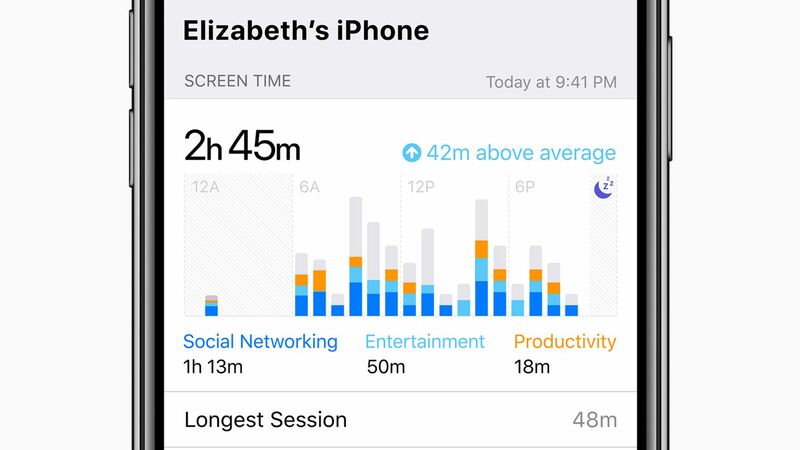 A new Screen Time app lets iOS users see how long they spend in different apps, how often they pick up their phone and how frequently they get notifications. There's also an option to set time limits to reduce usage of certain apps. Parents can also set limits for kids on a per app, per category or overall basis, as well as set "downtime" during which no screen time is allowed. How this stacks up: The tools are broadly similar to what Google announced last month at its I/O developer conference. The parental controls are also akin to some of those offered by Amazon in its FreeTime app for Kindle, Kindle Fire and Android. What they're saying: Some of those who have been leading the charge against tech addiction praised Apple's move. "With kids and teens spending as much as six to nine hours a day glued to their iPhones, these new features will go a long way in helping parents manage screen time, something we know they have been clamoring for," Common Sense Media CEO Jim Steyer said in a statement. "Apple’s iOS 12 digital wellness announcements today are another step forward for humane technology, and a reflection that public pressure works," said Tristan Harris, co-founder of the Center for Humane Technology. "Holding apps accountable for our time is the first step. Next we hope companies like Apple and Google hold apps accountable for affecting the quality of our relationships and all the ways we want to live." The bottom line: Apple is positioning the moves as part of being on the customer's side. But it also could help the company get ahead of criticism if a backlash over smartphone addiction picks up momentum. Apple's move isn't likely to end the debate, but it's adding powerful tools to make it easier for iPhone owners to understand their usage and take steps to manage it, if they choose. While parents still bear ultimate responsibility for their kids' device usage, Apple's new tools make it an easier choice to hand over the iPhone or iPad. There was a lot to digest from Apple's two-hour-plus keynote, even if the next iOS and macOS aren't chock full of new features. The announcements closely followed my January scoop that the company was focusing largely on performance and reliability, with some features being delayed until future years. As expected, augmented reality and the aforementioned parental controls were key areas of investment. The details: Apple also finally offered a little more information on its long-in-the-works plan to bring iOS support to the Mac, which we have also previously reported. Apple gave a "sneak peek" at what it said will be a multi-year effort to enable some iOS apps to run on the Mac. Apple is moving some of its own iOS apps this year, including Stocks and Voice Memos, while outside developers will get their first opportunities next year. Mac not going away: Apple SVP Craig Federighi was quick to douse speculation that Apple was looking to eventually do away with the Mac. "No," he said. "Of course not." In the meantime, Apple talked about what it plans to add to each operating system, with iOS 12 and macOS Mojave, both coming as free updates due this fall. iOS 12 adds new AR features, additional Animoji options, and custom actions for Siri, known as shortcuts. macOS Mojave will add a dark mode, Apple News, redesigned Mac App Store and the ability to instantly import photos using a nearby iPhone. Also, FaceTime is getting support for group video chats of up to 32 people. Plus: Apple made some notable changes to its App Store rules, including policies regarding free trials, cryptocurrency and remote streaming apps. “Well, unfortunately with Facebook, it is a great company, but we’re seeing this pattern repeat itself,” Warner said. Speaking of Facebook, Apple also didn't shy away from criticizing the company at its annual Worldwide Developers Conference in California on Monday. The remarks were made in conjunction with the announcement Monday that Apple would be flagging "like" buttons that track internet activity of users logged into certain social platforms, like Facebook. Go deeper: Read Sara Fischer's full story here and subscribe to her weekly Media Trends newsletter here. Baratunde Thurston, author of the book "How To Be Black" and a former writer for The Onion and "The Daily Show," published a manifesto Monday. It calls for a host of new practices at large tech companies, including collecting less information by default, allowing users to view and analyze their own data, and offering full transparency on what data is being collected. Apple's Worldwide Developer Conference (WWDC) continues in San Jose, Calif., through Friday, but without reporters as the rest of the event is closed to the press. Computex, the big Asian computer component trade show, kicks off in Taipei. The Securities and Exchange Commission named Valerie A. Szczepanik to head its digital currency efforts. Snap hired former Amazon executive Derek Andersen as finance VP, reporting to CFO Tim Stone, according to Bloomberg. Silicon Valley must address the lack of diversity in its workforce, according to former U.S. Chief Technology Officer Megan Smith who was speaking at an Axios event Tuesday morning. Qualcomm introduced the Snapdragon 850, a new version of its high-end mobile processor designed to power always-connected Windows 10 PCs. Samsung was the first computer maker to say it would use the chip. Asus introduced new ZenBook Pro laptops that replace the traditional touchpad with a "ScreenPad," a 5.5-inch touch screen display that can act as trackpad, but also as a secondary display or home to various controls, per The Verge. Think of it as a different take on the MacBook Pro's Touch Bar. Dataminr, a startup that analyzes public data about events in real time, has raised $221 million in new funding. Washington State's AG filed suit against Facebook and Google, alleging the tech giants violated the state's campaign finance laws. Can you imagine memorizing Pi — to 70,000 digits?